The plan, my loves, was to share with you a recipe for linguine with garlic bread crumbs that we tried Monday night. The problem is that we didn’t like it. At all. Hugely disappointing. Dry and relatively tasteless; DH described it as “noodles with sawdust.” There were leftovers, and I tried stirring some summer-ripe grape tomatoes in, but even that couldn’t save this dish. Thumbs down, and I don’t recommend it. So instead, we’re going to talk about one of my favorite toys today, and it’s something I picked up at Target on a total whim, for less than $5. It’s my handy-dandy batter bowl. My mom had one of these when I was a kid, only hers was Jadeite and lovely (of course, I was younger and stupid when she sold her house years back and didn’t want it, and now that I have an appreciation for such beautiful things, have no idea where it wound up. Lesson learned). I came to my senses about such things a year or so ago, but by then had kids and budgets and a very tightwad way of living, and picked up a cheap, clear plastic model for myself. It has served me well and is one of the most useful gadgets in my kitchen. I bought my batter bowl for pancakes, but it is an absolute miracle for cupcakes. 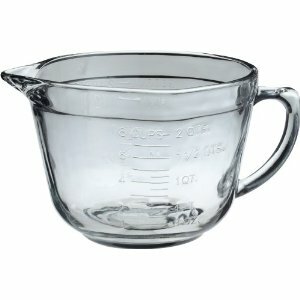 I’ve used it for waffles, funnel cakes, and all sorts of sauces. Anything you’d pour, this is your tool. It’s simple and easy and pretty mess-free, and gets tossed right in the dishwasher. One bowl for mixing and pouring. I like that. Such is my wisdom for today. If you don’t have one of these, get thee to the store and pick one up–you’ll love it. And if your mom has a gorgeous old one, don’t let it go. 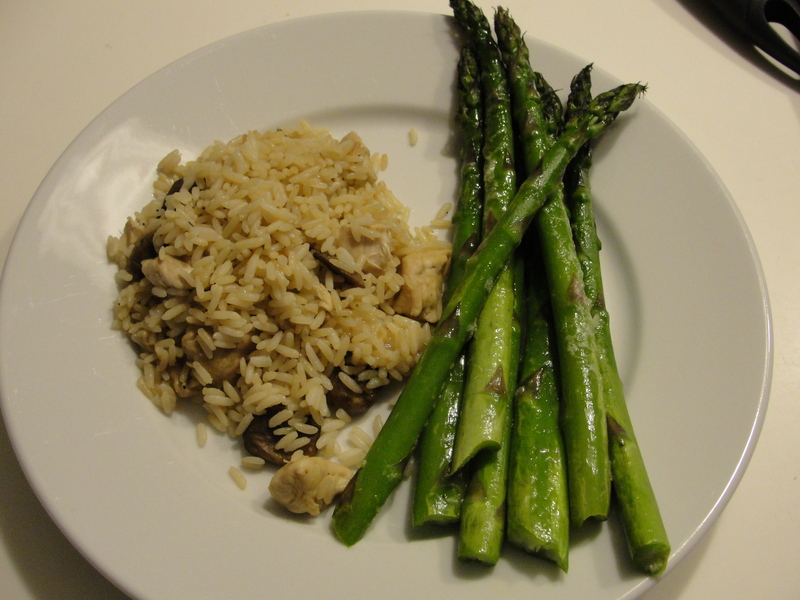 Shameless Plug: Have you become a fan of Playing With My Dinner on Facebook? We have a fun wall where we chat about lots of kitchen-esque topics, and I’d love to see you there. Click here and then click “like,” and tell your friends! Thanks! DH drives a lot and frequently stops at Wawa for afternoon pick-me-ups. (Side note: the man has an uncanny amount of radar for locating Wawa stores wherever he goes, despite the fact that there are none anywhere close to where we live. It’s creepy, if you ask me.) And he frequently brings home plastic-wrapped soft pretzels for the kids, who go nuts for them. I tried one the other week. Yeah, they’re good. But I figured I could do that and for less than a buck or two a pretzel. The first try was a pretty big failure. The dough–which was my regular pizza dough–didn’t want to twist into pretzel shapes, and then it didn’t want to bake all the way through, and then its egg wash did something bizarre that we won’t discuss, just in case you figure out I’m a tremendous fraud and stop reading the blog. Everybody tried a pretzel and nodded politely, and then I threw them away. It happens, gang. You are going to throw food in the trash from time to time, just because a recipe didn’t turn out. Accept it as an offering to the kitchen gods, and try again! Yesterday, I tried again, using a copycat recipe I found online that’s supposed to turn out just like those mall pretzels. Only I screwed it up, because I was trying to do real work in between tossing ingredients together, and added in some topping ingredients right in with the dough mixture. I flipped the bread machine to the dough setting, hit the start button, realized what happened, stared through the little glass window and cussed a bit, and then decided to let it go and see what happened. 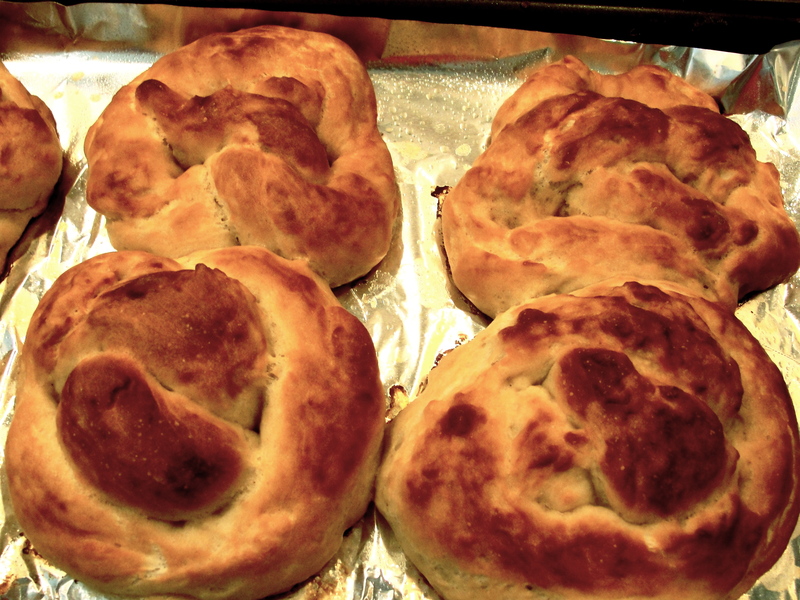 The dough did its thing, I struggled through twisting and dipping and rising again (I am not a pretzel twister, just so you know), they baked up and cooled, and then the kids tried them. Mistakes rule sometimes. Just keep going. Taste and adjust as necessary, but keep moving forward–you never know when a family favorite will be born. I made this dough in my bread machine, using its pizza dough setting. Use the regular dough setting on your machine if it has one, or you can do this by stirring the dough ingredients together with a mixer, kneading it for 5 minutes or so on a flour-sprinkled counter, and letting it rise in a covered bowl for an hour. This recipe made about 8 pretzels for us. We devoured a few (*blush*) and I wrapped the leftovers up in plastic wrap, just like Wawa. They’re still yummy this morning. I’m betting these would freeze really well, too, and then defrost and warm up really nicely in the microwave. We’ll find out soon–the short people already want to know when we’re making more. Next time, I’m skipping the twisting bit and either cutting the dough into chunks for pretzel bites (adjusting the baking time accordingly), or making simple twisted pretzel sticks. Sprinkle the yeast over the 1 1/12 cup of warm water and let it sit a few minutes. In your bread machine or the bowl of an electric mixer, combine the flours, brown sugar, salt, and butter. Add in the yeast mixture, and either run a dough cycle or mix and knead as described above, and then let rise for an hour. When the dough is ready, heat your oven to 450 degrees, cover a baking sheet with foil, and spray that with butter or nonstick spray. In a large bowl, stir together the 2 cups of warm water and the baking soda. Punch your dough down and divide it into 8 chunks. Roll each chunk into a long rope (it should be about 1/2 inch thick), rolling in more flour if you need to. Carefully dunk each raw pretzel in the water/baking soda mix (stir that up between pretzels), and lay them on the foil-covered baking sheet. When they’re all done, lay a clean dishtowel over them and let them rise a half-hour or so. Then, bake them about 10 minutes or until golden brown on the outside. Enjoy warm or at room temperature, either plain or brushed with melted butter and cinnamon sugar or Kosher salt. I almost fell into the cereal trap last night. You know the one–kids out, husband held up by unforeseen work event, tons to do while the house is blissfully quiet, and the chicken in the fridge will keep for another day. Cereal would have been quick and easy, with no cleanup other than chucking a bowl and spoon into the dishwasher. And I almost did it. I had the bowl in my hand when my inner mom spoke. She was right. The bowl went on the counter, the chicken came out of the meat drawer, and I enjoyed a delicious, comforting meal of chicken, broccoli, and noodles in a sweet and salty Thai dish, all by myself. It was wonderful. I’d been looking for a recipe for pad see ew since shortly after Christmas, when I had my first serving at a local Thai restaurant. The problem with most recipes for the dish is that they call for black or sweet soy sauce, and no store near me carries such a thing–even the fancy-schmancy gourmet market (I checked). The substitutes I found online varied wildly, calling for everything from molasses to star anise, and rather than re-invent the wheel, I kept looking for a recipe that didn’t call for anything I couldn’t buy in my local market. The one ingredient caveat I’ll give you is this: the recipe calls for oyster sauce. Do not fall into the same trap I did and buy Oyster brand fish sauce. It’s not the same. The oyster sauce you want has the consistency of ketchup, and is sweet and dark. You do need fish sauce for this (I had some that feeds my pad thai addiction), so go ahead and grab some of that Oyster brand if you want, but you do need real oyster sauce too. The original recipe for this dish called for rice noodles. I used Dutch style egg noodles instead. I know. Not authentic. But egg noodles scream comfort and happy to me, which is what I was going for, and they don’t clump up and get hard like rice noodles can. Make sure you drain whatever noodles you use very well before you add them to the wok. You don’t want any extra water getting in there. This would also be delicious with a punch of red pepper flakes, if you like your Thai food on the spicy side, or the addition of some sliced mushrooms. If you’re not cheating on the broccoli, cook it (boiling or steaming) until crisp-tender. Drain. Heat the oil in a large wok or skillet over medium heat. Stir in the garlic and let it cook for just a minute, moving it constantly so it doesn’t burn. Stir in the green onion. Add the chicken in a single layer, cover, and cook about 3 minutes, or until done on one side. Flip it and cook until it’s edible. While the chicken is cooking, whisk the cornstarch into the water (not the other way around or it’ll clump up on you), and stir together the other sauces and sugar in a bowl. Once the chicken is cooked, nudge it towards the sides of the pan, so there’s a bare spot in the center. Scramble your egg in that bare spot. When it’s firm, stir it into the chicken, and then stir in your cornstarch mixture and bowl o’ sauces. 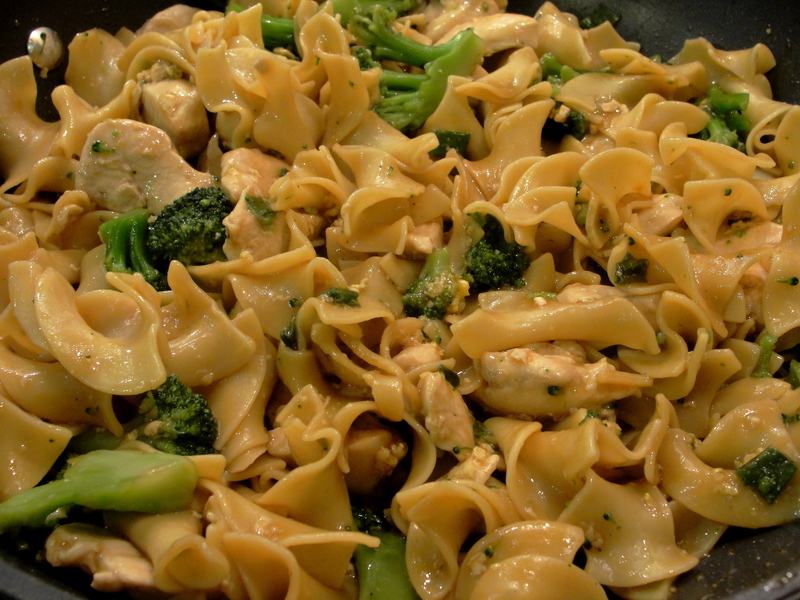 Now, stir in your drained noodles and broccoli. Let it cook perfectly still for about 3 minutes, and then stir it up and do that again. You want some of the noodles to start caramelizing on the bottom of the pan. Let them brown a bit. Chase your family out of the house, and enjoy. It was not a weekend for the record books. That’s a nice way of saying it, I think. It started with a farewell party for someone I very much like who’s moving far away (fun party, but made me super sad), then went to another event where my feelings got smashed, mid-pointed with the death of a good friend of DH’s, and snuck out of town with a visit to urgent care, which never ends well. I had a good cry, hibernated with my Kindle for several hours, visited with my friends Ben and Jerry, got a decent night’s sleep, and this morning, decided that the blueberries in my refrigerator were not going to cook themselves, and mucked around with a recipe. 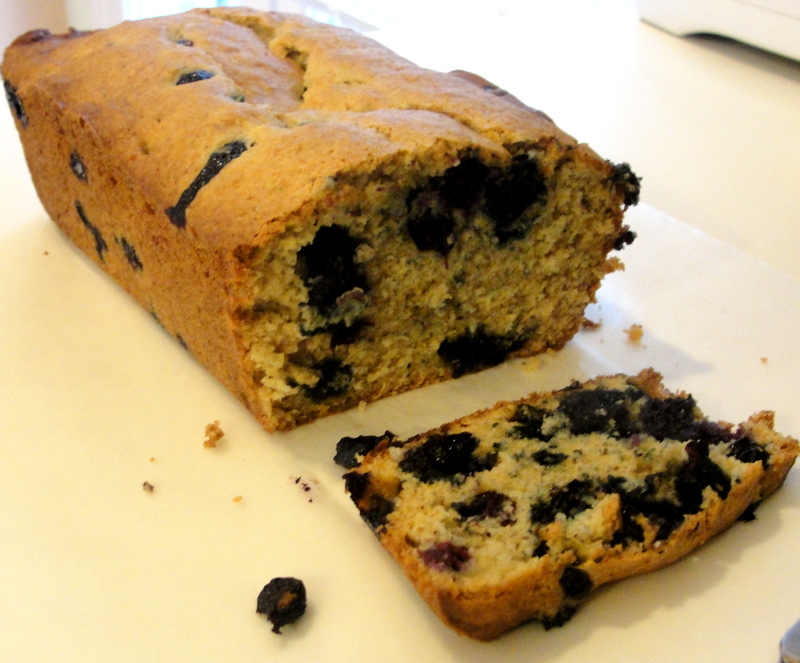 We all have banana blueberry bread recipes in our collections–it’s a staple, both because it’s good and because it uses up fruit that threatens ickiness in a way that everybody will eat. I’ve had this one for awhile, but finally got around to messing with it this morning. And it, my sweets, it good. I can’t remember where the original recipe came from, but I swapped out brown sugar for half the white, added some vanilla extract, and used more blueberries than it called for. 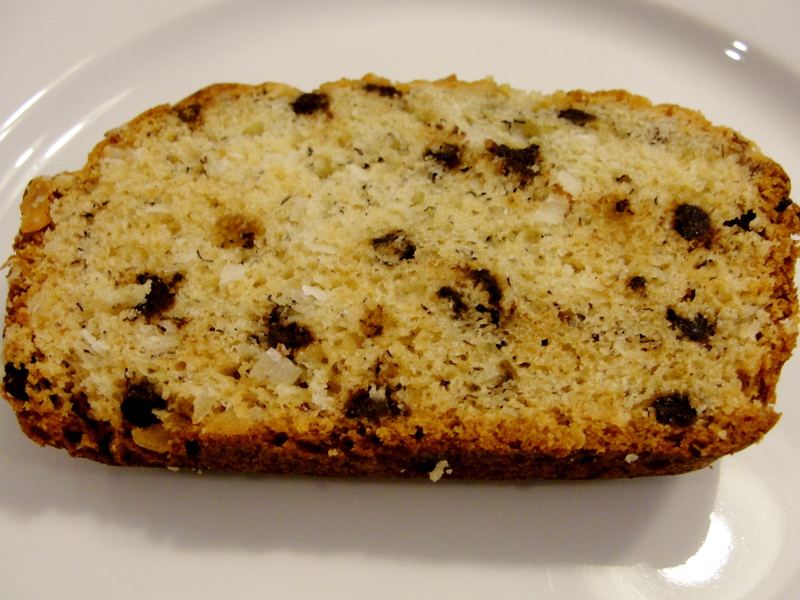 The result is a very quick and simple sweet bread that could easily pass as a coffee cake, perfect for breakfast, tea, or dessert. The brown sugar caramelizes around the crust (it’s begging to be a muffin, I think) and gives a yummy hint of that flavor throughout. It made me happy, and we could all use a shot of happy from time to time. I hope you’ll try it. Preheat your oven to 350 degrees and spray a loaf pan with nonstick spray (I swear by Baker’s Joy if you can find it). With an electric mixer, cream together butter and sugars until they’re light and fluffy. Add vanilla. Beat in eggs, one at a time. Combine flour, baking powder, baking soda, and salt. With your mixer on low, stir in half of that mixture. Then stir in your mooshy banana, then the rest of the dry goods, and finally and very gently stir in your blueberries. Spread the batter into your loaf pan and bake about 50 minutes. So the thing about this recipe is: you’re going to have to look past the brown. The original recipe came from Cooking Light. They called for instant rice and different liquid values. I don’t really get instant rice, to be honest, since regular rice is so super simple to make and feels so much more substantial in the mouth, and so I adjusted out of necessity: there is no instant rice in my pantry. They also used jarred chopped garlic, which, as we’ve discussed, is bitter and nasty, and has no business in your kitchen. Frozen garlic cubes are a much better option if you don’t want to chop up the fresh stuff. They also wanted parsley in this. Parsley is another “ick” in my house–it tastes like feet and brings nothing to food, as far as I’m concerned. I used a little fresh basil, which played off the garlic and Parmesan beautifully. We all liked this. The kids picked out the mushrooms (more for me! ), and devoured the rest, and DH and I both enjoyed it (he sprinkled a little hot sauce on his), especially the next day, when the flavors had some time to play together and develop a bit. It takes one pan, which is a plus, and was comforting and delightful. Heat oil in a large skillet over medium-high heat. Add the onion, garlic, thyme, and mushrooms and saute about 5 minutes, until the onion softens and the mushrooms darken and release some of their juice. Add the chicken and saute a few minutes until it’s browned on the outside. Stir in the wine, salt, and pepper, and cook about 3-5 minutes, until the liquid reduces a bit. Stir in the rice and broth. Bring to a boil, cover, reduce heat to low, and simmer about 20 minutes or until rice is cooked. Remove from heat and stir in the cheese and basil. Enjoy! I had a rare half-hour of nothing yesterday afternoon, and flopped on the couch to channel-surf on networks other than the Cartoon one. I flipped past The Cooking Channel right as the top of the hour hit, and decided to check out the show–Hungry Girl. You all know Hungry Girl. Her website has become something of a cult for Weight Watchers followers (I love Weight Watchers, for the record), and her email newsletters, cookbook, and this new TV show have developed quite a large audience following. So…why not just use egg whites? Leaving that where it fell, have you ever read a container of egg substitute? More than 20 ingredients, some of which I can’t pronounce, including a sweetener that’s used mostly in mass-produced candy, and a ton of sodium, at least compared to a real egg. Science has pretty much proven that contrary to what we learned in the 1980s, eating eggs does not raise your cholesterol. So that argument is out, assuming you’re not downing a half-dozen eggs every day. She’s saving maybe 40 calories an egg, I’ll give her that. But she’s also ingesting all sorts of manufactured things that eggs don’t contain. This was the first time I caught Hungry Girl, and I have to say, I think I’d rather eat less of food made with real ingredients than follow her odd eating habits. That show is a testament to processed foods–foods that are full of chemicals, artificial sweeteners, and oh my God, the salt. It was nothing but fat-free this and plastic-wrapped that and artificial ingredient substitutes, which, I’m sure, help you stay rail-thin, but at what price? I’ll stick with eggs, thank you very much. Real cheese. Vegetables that came out of the ground and not out of a factory somewhere. I’ll hang on to my extra bits of skin and pudge if that’s what it means, but I am not into downing vials of lab chemicals with every meal. I won’t be watching Hungry Girl again. And tomorrow, I’ll share a real recipe, made with real ingredients, that you can enjoy without worrying about what the heck just went into your family’s mouths. Thumbs down, Hungry Girl. Thumbs down, Cooking Channel. Very disappointing.